Beautifully engraved certificate from the Indiana Federal Corporation issued in 1993. This historic document was printed by the American Banknote Company and has an ornate border around it with a vignette of the company logo. This item has the printed signatures of the Company’s President and Secretary. 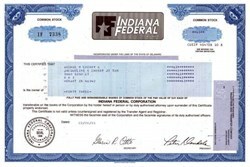 Indiana Federal Corporation Inc was acquired by Pinnacle Fin Svc Inc. Pinnacle is a Michigan based bank, originating in September of 1931 in St. Joseph, Michigan under the name the Peoples State Bank. On April 29th, 1996 Peoples State Bank merged with First Federal Savings Bank of Indiana, and took a new name: Pinnacle Bank.